Legend has it that in 1964 Falkirk made a bid for Bobby Lennox and that Celtic were very close to accepting it. 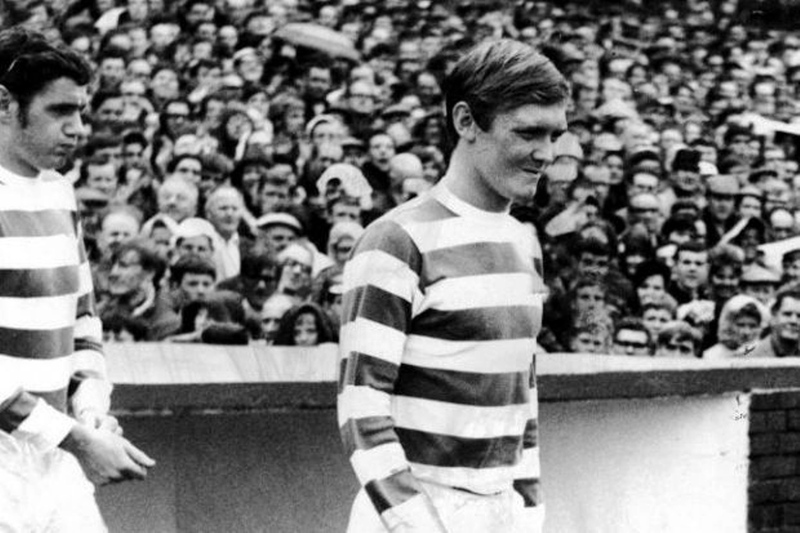 It’s not clear if Jimmy McGrory still had confidence in the young Bobby or, more likely, that old Bob Kelly saw something worthy in him, but fate was kind to Celtic and Bobby Lennox stayed and went on to have 16 more glory filled years at Parkhead. Celtic pre Stein were an absolute shambles and yet what talent the club unknowingly possessed. Johnstone wandered aimlessly over the park, Murdoch looked slow at inside forward and up front Chalmers and Lennox ran around like headless chickens making little impact. Stein’s arrival changed things utterly. Square pegs now went in square holes and he now concentrated his players on ‘space’. Finding space all over the pitch was now a priority and more importantly his midfield players began to put the ball into space for the forwards to run on to. This required forwards with genuine pace and Stein was fortunate to inherit the speedy Chalmers and the even faster Bobby Lennox. 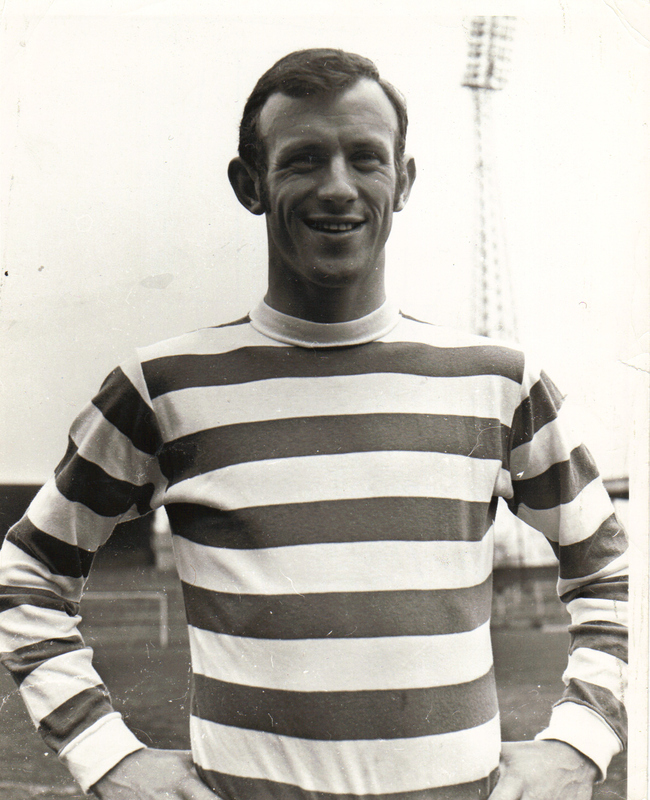 Older Celts will recall the transformation in Bobby Lennox in late 1965. The clueless inside forward was suddenly converted into a forward of some distinction and although his pace was always his greatest asset Lennox became a first class finisher. Not only did Bobby score goals but he now began to score important goals. 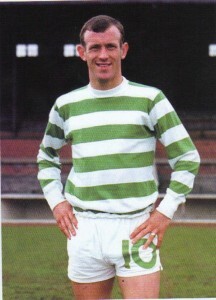 The first major goal Bobby scored was against Hibs at Ibrox in the LCSF of October 1965. Ninety minutes had passed and with Hibs having a 2-1 lead it was Bobby who scrambled home a vital equaliser. 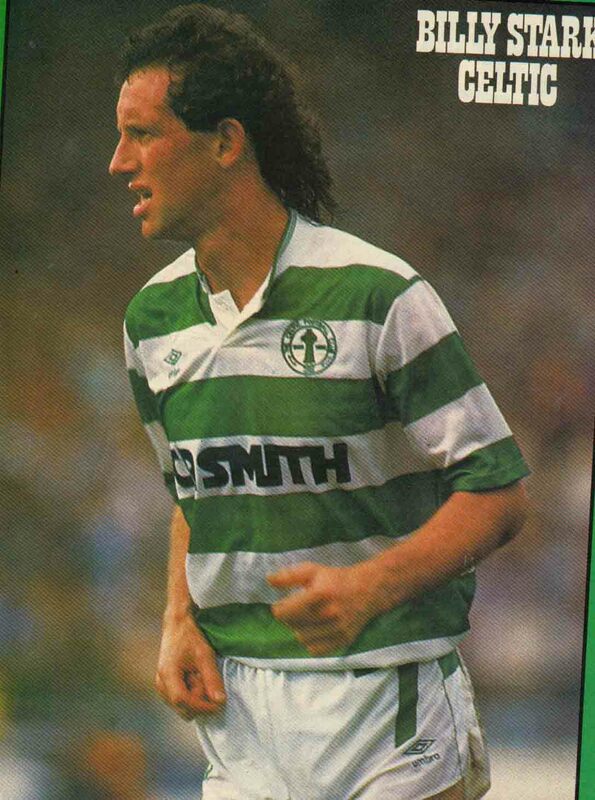 Celtic won the replay, defeated Rangers in the final and Bobby’s Celtic career was now about to take off. Lennox now went on to become a goal scorer of some repute. It’s easy to recall him as an orthodox left winger in the number 11 shorts but in truth Bobby seldom played as a wide man. Stein knew that Bobby could best damage teams by racing through the middle and that became his strength. 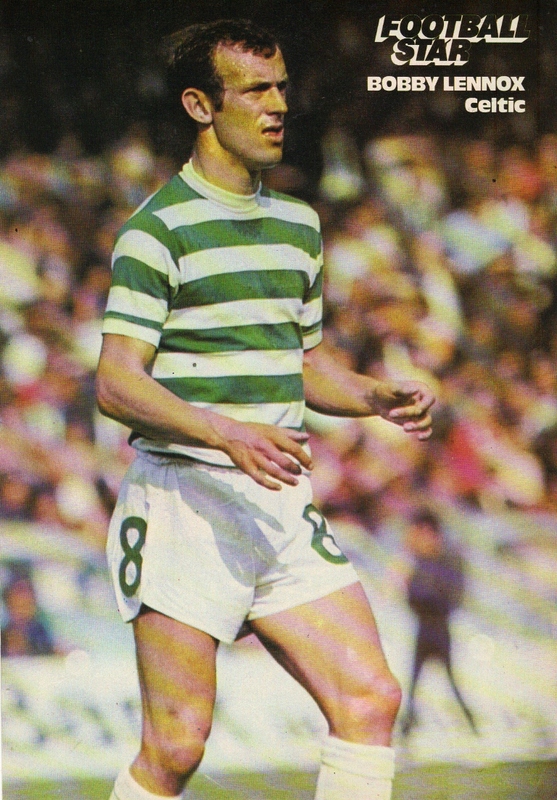 He was a versatile player, able to play on the right or the left and in his time at Celtic he appeared in all five of the forward positions on regular occasions. Now the goals began to come. In April 1966 he put Liverpool to the sword at Parkhead and in the second leg, with Celtic 0-2 down, he scored a vital equaliser which was controversially disallowed and out went Celtic. A riot ensued amongst the visiting Celtic fans and the Celtic players would use this sore experience to good effect the next season, especially in Europe. Bobby was to get used to the disappointment of having goals disallowed especially for marginal offside decisions when his turn of pace sometimes went against him. There is an anecdote of an incident at Tannadice in the late 60’s when an over zealous linesman had pulled Bobby up a number of times. Next time the ball was played forward Bobby was on the half way line just inside his own half and he feinted to go forward but held back. The linesman’s flag shot up immediately as Bobby stared at him accusingly as you can’t be offside in your own half. The linesman was made to suffer from the Celtic fans behind him in the old Tannadice enclosure but it’s a fine example of how Bobby and Celtic often suffered. In this modern age a striker level with a defender is now deemed onside and if this rule was in force during Bobby’s time then he would have added to his goals total considerably. 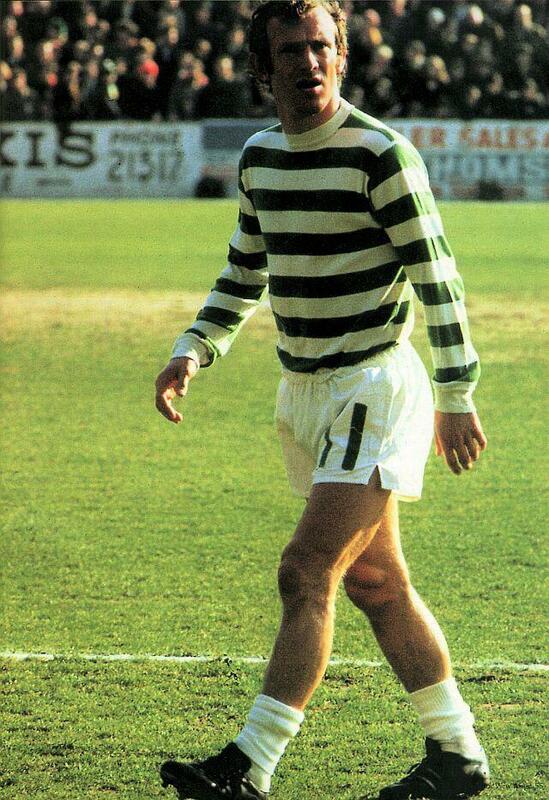 Much to the delight of the Celtic fans Bobby had a fine record in games against Rangers. He scored 14 times against them which is quite an achievement considering there were only two league games per season back then. Some of the goals were memorable and worth recalling. 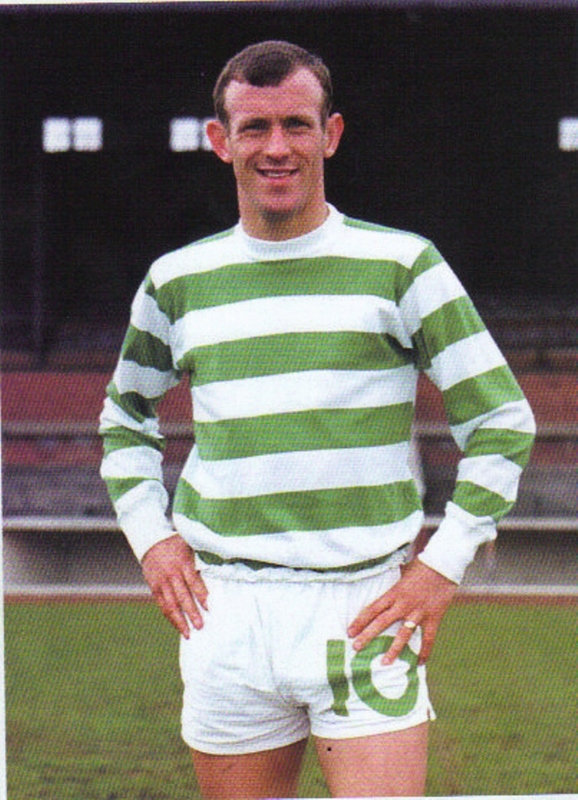 In August 1966 he scored a fine hat trick against Rangers at Ibrox, the first of the three being a great effort where he beat a Rangers defender and scored with a scorching shot from 25 yards. 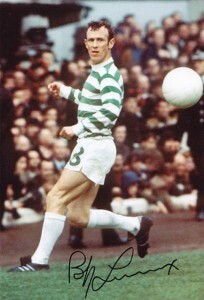 A matter of weeks later he scored the winner in the 1966 LCF with a well crafted goal. Auld floated a ball to the back post where Joe McBride had peeled off to find space. Joe headed back across goal and Bobby arrived at speed to volley the ball home. In Europe he scored a highly respectable total of 15 goals although perhaps his most important goal on European soil was not in a competitive match. In June 1967, Celtic the newly crowned European champions were requested to play Real Madrid in a testimonial for the legendary Alfredo Di Stefano. Real regarded themselves then as Kings of Europe and indeed still do. 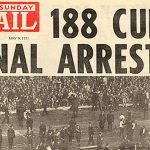 Celtic had a lot to lose and if they had lost then critics would have used this as ammunition to show that the Lisbon triumph had been somewhat fortunate. As if happens the Celts rose to the occasion and showed they were genuine champions. Jimmy Johnstone had the game of his life and after another tremendous run Jinky created the chance for Bobby to score the games only goal. Celtic’s name was now renowned across the continent. 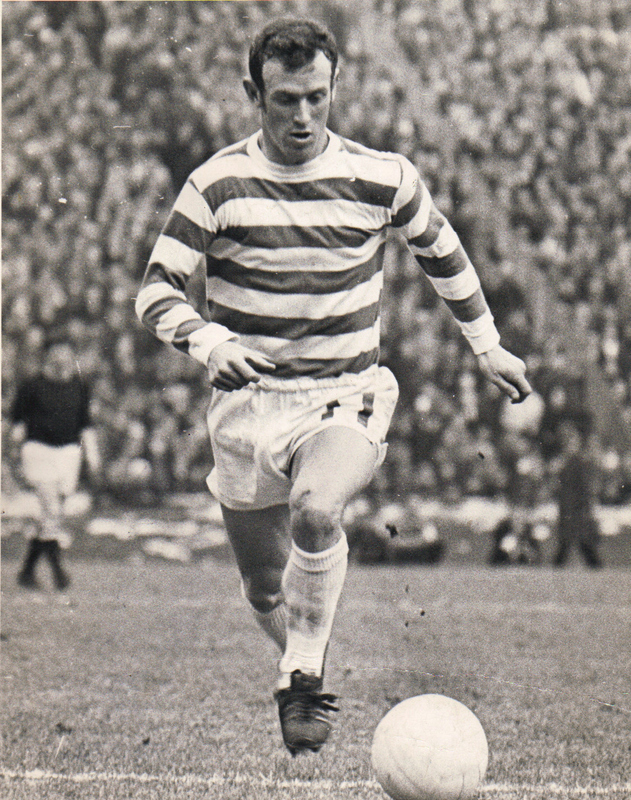 Lennox was a vital part of the nine in a row era but his finest achievement during this period came in 1967/68 when he scored an incredible 32 league goals in only 28 games including 20 goals in the last 12 matches. In the penultimate game of the season Celtic were level with Morton at Parkhead at 1-1 with only seconds remaining. It was Bobby who then cropped up with a scrambled winner much to the delight of the cheering fans. Had he not scored that goal then there would have been no title and no nine in a row to boast of. The league race went to the last game and Bobby appropriately scored the two goals which beat Dunfermline and ensured the league stayed at Parkhead. Despite his tremendous feats for Celtic that season Bobby was not awarded the Player of the Year award by the Scots’ press as was expected. That award went to Gordon Wallace of Raith Rovers who finished 16th in the table. Wallace must have had some season to beat Lennox’s form that year. By the mid 1970’s Bobby’s appearances were becoming more sporadic but he was still contributing when required. In November 1976 he had a severe setback when he broke a leg at Ibrox after a debatable tackle by Rangers captain John Greig. 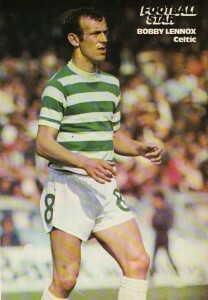 This led to Bobby missing the rest of the season and although he returned to the first team for1977/78 Jock Stein allowed him a free transfer to go to play in America for Houston Hurricanes. In those days transatlantic flights only departed from Prestwick and Jock Stein travelled to Ayrshire to see the wee man off as surprise. However, unknown to Stein, Bobby and his family were travelling from Glasgow to London for his flight to the States. Disappointed, Stein managed to call Bobby at Glasgow and the normally unsentimental Jock was said to be close to tears as he bid farewell to his player over the phone. Lennox speaks fondly of his American experience but within six months the chance to return to Parkhead cropped up. 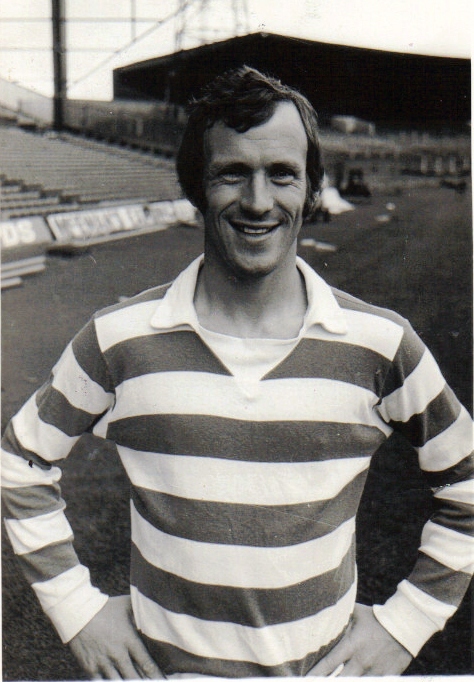 New manager, and ex team mate Billy McNeill needed numbers and experience and although it was only meant to be for a few months at first, Bobby was to stay on for a fine Indian summer to extend his career. In May 1979 Celtic were on a fine run and faced Rangers at Parkhead in the last game of the season in a game to decide the title. With Celtic losing 0-1 and down to ten men Bobby was thrown on as a substitute as a desperate resort. 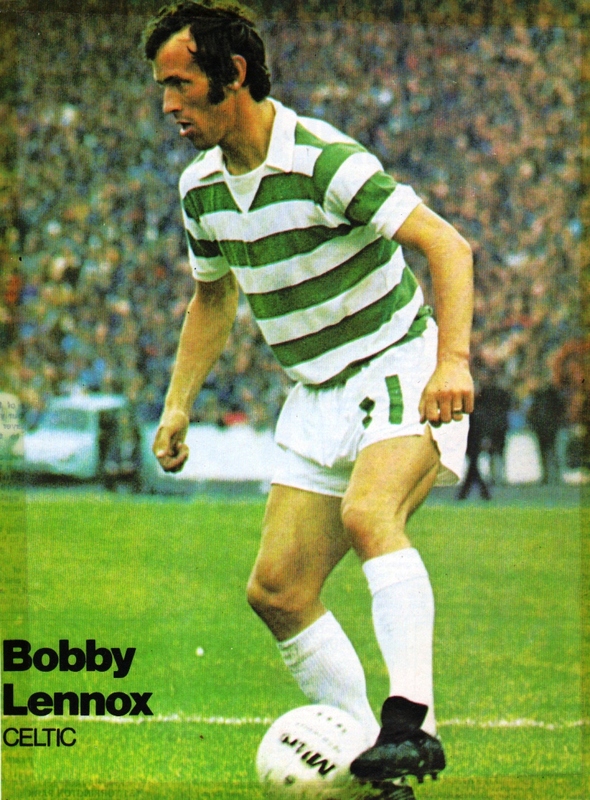 It was an inspirational move by McNeill as Bobby’s pace and experienced stretched Rangers to the full and it was no small thanks to Bobby that Celtic ran out winners by 4-2. 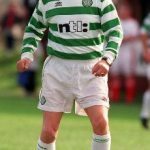 By this time he was the last of the Lisbon Lions and he ensured that the roar of the Lions could still be heard at Parkhead on that glorious night. Season 1979/80 was to be his last. Bobby had the privilege of scoring the last goal of the decade at Ibrox on 29th December 1979 when he salvaged a point for Celtic with a fine equaliser. 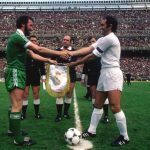 He also had a sentimental return meeting with Real Madrid in the European Cup only there was to be no happy ending this time as Celtic when down 2-3 on aggregate. However his last ever game was the 1980 SCF against Rangers at Hampden when he again made a vital appearance as a substitute. With the clock running down and Celtic leading 1-0 Bobby used his experience to the full. Together with Davie Provan he took a succession of short corners and each time a Rangers’ defender approached they he simply knocked it off them for another corner. The ploy worked well and Celtic won. Sadly, in pre season of 1980, he received a serious toe injury and at the age of 37 he was forced to call it a day. 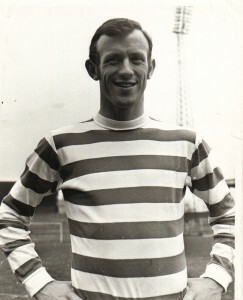 Bobby Lennox was a wonderful example of a perfect professional. He lived his life properly off the park and never let Celtic down on the field although he was sent off twice in the unusual venues of Montevideo and Athens, both due to dubious decisions by foreign referees. His career spanned a remarkable 18 years and in his debut game his team mates included Pat Crerand, Billy Price and Bobby Carroll and in his last game he appeared with Alan Sneddon, Mike Conroy and Frank McGarvey. 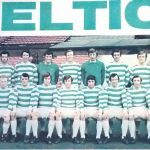 That shows the contrast in the Celtic teams he appeared in through the years from the early 60’s to the early 80’s. And with 25 winners medals to his name Bobby is arguably Scotland’s most successful footballer. Celtic fans will always recall Jinky’s dribbling, Murdoch’s passing and Auld’s guile but very few Celtic players have been so genuinely loved and respected by the supporters than Bobby Lennox. In all my years of supporting Celtic I have never heard anyone of any persuasion utter a bad word about Bobby. 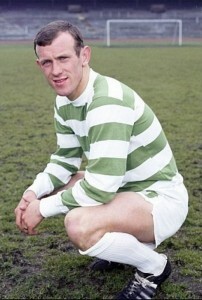 So raise your glass to the memory of Bobby Lennox – the happiest wee guy who ever played for Celtic.